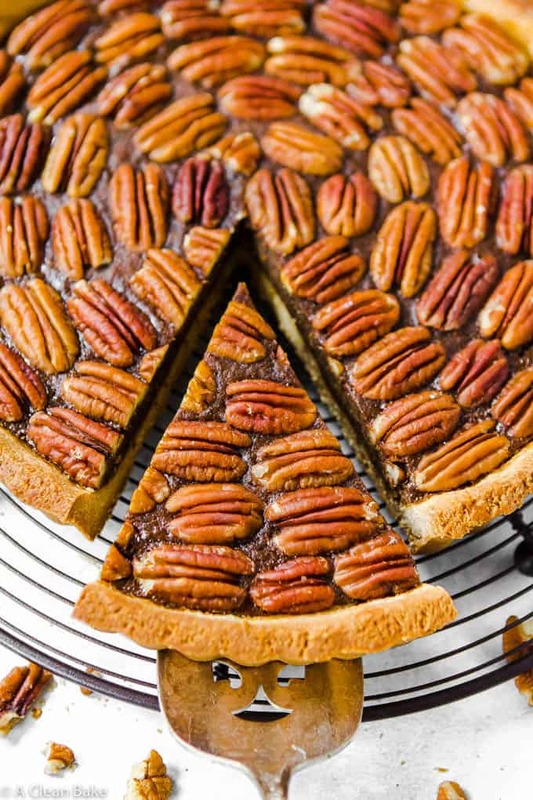 Gluten free pecan tart is like a more delicate version of a pecan pie. 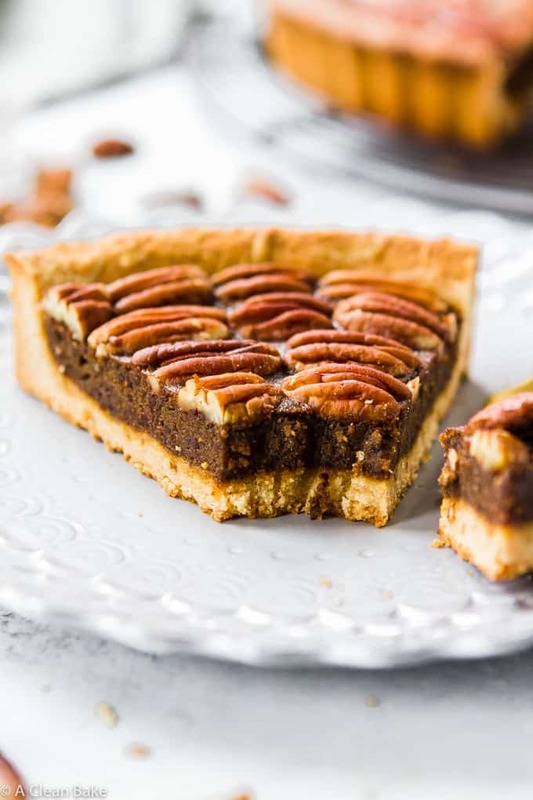 Use a fluted tart pan to make an elegant crust, fill it with rich, naturally sweetened molasses-y filling, and top with an beautiful array of pecan halves. No one will be able to resist a slice! If this recipe sounds familiar, it’s because it’s a long-overdue update to an older recipe on this site that has always been good, but is now great. I tweaked the recipe a bit, and updated the pictures. When I first posted this tart, in 2014, I was embarking on my first holiday season as newlywed. We’d just gotten married and then returned from our “minimoon“, as the kids call it, in Puerto Rico, where it rained nearly the whole time, but we didn’t care, because it just meant an excuse to nap and watch Law and Order. Despite the rain, being anywhere warm, for any amount of time, during the 6-8 months of the year when Chicago makes leaving your house nothing short of pure misery, was wonderful. To return to the single digit temperatures was a rude awakening to begin with and then – don’t ask my why I remember this – there was some kind of freak accident-slash-planned-maintenance-that-they-forgot-to-warn-us-about with the gas lines that resulted in no heat or hot water for almost 24 hours. I had made this tart before the house started to sprout icicles inside (KIDDING. Mostly.) and used the lack of heat as an excuse to eat practically the whole thing. To stay warm, of course. This year, it’s less chilly, and we have a working furnace (thank goodness), but I can assure you: this tart tastes just as good in normal, sane temperatures as it does when you’re huddled under an electric blanket with your laptop perched on your lap (as much for the warmth of the machine as to get some work done), and two hoodies on. We enjoyed this tart this year after a (toasty warm) Thanksgiving dinner, and I must say, it was kind of one of the highlights for me. 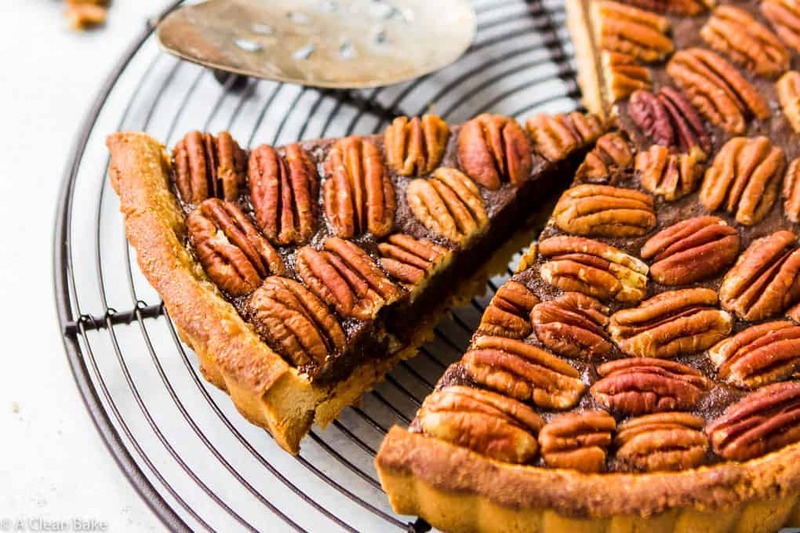 I think I described this gluten free pecan tart best in a single word in my original post: creamysilkysweetbutnottoosweetmildlycaramelydeeprichperfection. 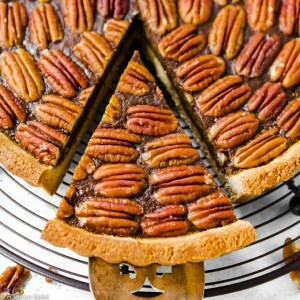 This gluten free pecan tart is like a more delicate version of a pecan pie. 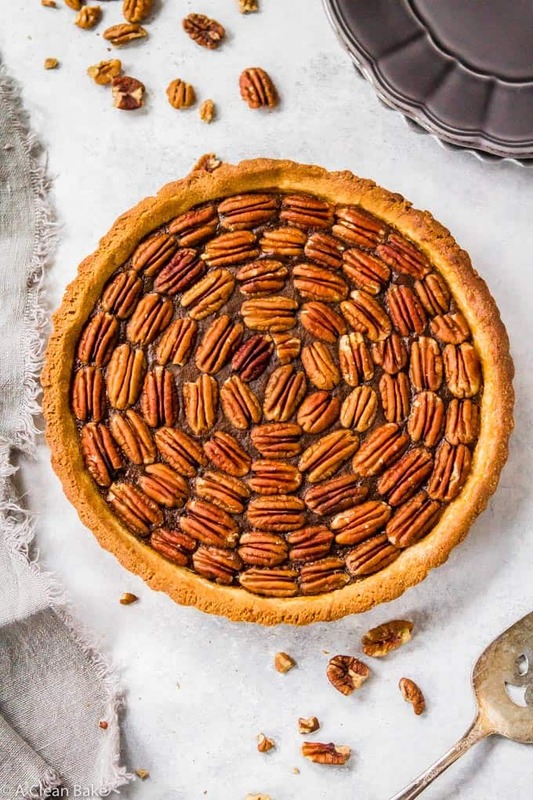 Use a fluted tart pan to make an elegant crust, fill it with rich, naturally sweetened molasses-y filling, and top with an beautiful array of pecan halves. No one will be able to resist a slice! Prepare the crust dough and put it into a 9" tart pan with a removable bottom. Chill in the refrigerator for a minimum of 30 minutes, then preheat the oven to 350F. Once preheated, transfer from the fridge to the oven without letting it warm to room temperature and bake for 10 minutes until the edges begin to turn slightly golden. Remove from oven and set aside; do not turn off the oven. In the oven that is still heated to 350F, bake for 35-40 minutes, or until the crust has turned a deep golden brown and the batter has turned from shiny to matte. A tester may not come out completely clean, but it should only have a few crumbs on it at most. Remove from oven and let it cool and set on a wire rack before removing it from the pan to slice and serve. Store leftovers in an airtight container at room temperature for up to three days, or in the freezer for up to a month. It’s great to be back! 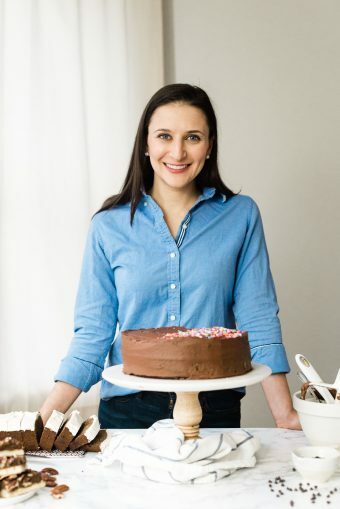 I’m so glad you are as excited as I am about this recipe and I hope you get to try it soon!! These photos are gorgeous and made me really want some of this tart! I usually don’t enjoy pecan pie because I think it’s too sweet, but I bet this version would suit me perfectly. Thank you so much Becky!! I have the exact same complaint about pecan pie – the sweetness tends to be way too much for me – so I think you’ll really like this one. It’s sweet *enough* without being overly so, you know? Yum, this looks amazing, Nora! 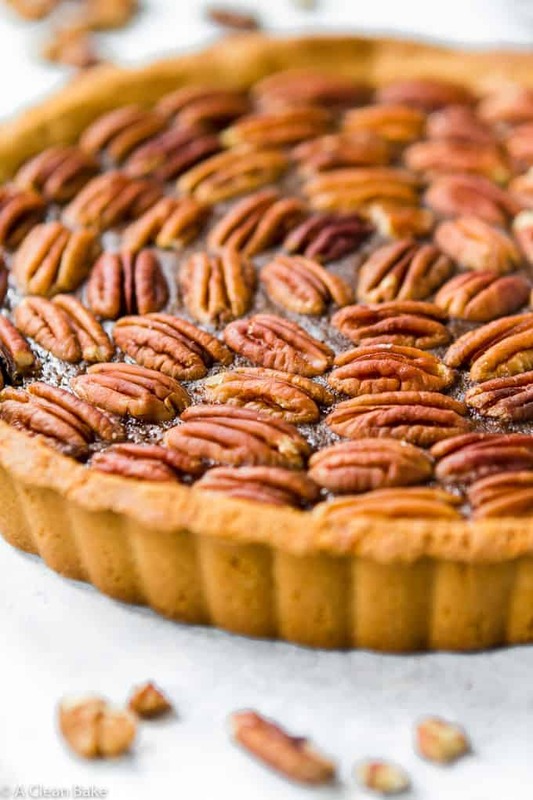 I’ve always thought that traditional pecan pie is a bit too rich and sweet. Thanks Caroline! I totally sympathize. I am always disappointed by overly decadent pecan pies. Hopefully you’ll like this one better! Thank you so much, Allie! Same to you – bundle up!! Looks so good!! Thank you for sharing on WholeYum!! Thanks, guys! I love your site and am happy to be able to contribute! 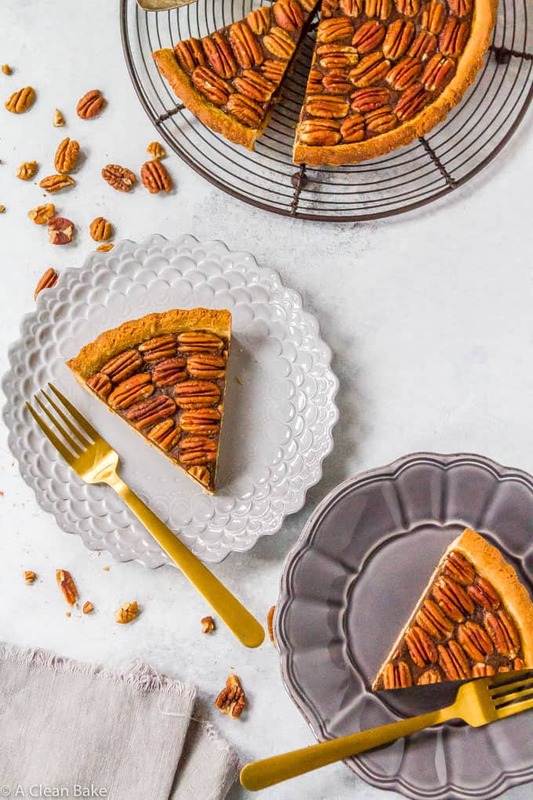 This is such a beautiful pecan tart, like seriously it’s a work of art….simply stunning, if I made that I would just stare at it all day!